These photos are of the Choir Boys Law Enforcement Motorcycle Club. Mr. Andy “Back Door” Baxter give me his card when their club was in, in June this summer. Also received a very cool ‘chip’ that says, US Border Patrol. What a great group of guys! Some retired law enforcement and some active duty officers. I was most impressed by the work they do, raising money for fallen officers’ families. What a calling! 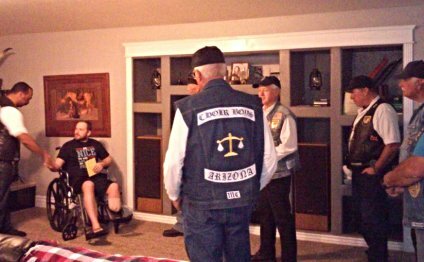 It was my understanding they were all in this area to meet up with a chapter than had formed in September of 2011 here in Colorado. God’s Speed and Blessings to you all! What can you really say to that name! What a fun motorcycle club. As they put it to me they “are of a certain age”. The Ole Fartz were traveling with family and having a great time, and hail from the Santa Fe area of New Mexico. Imagine how excited we were to visit with the Hamsters! This group has a truly unique history and consists of riders from all over the United States and several members from Turkey, Cyprus, Australia, Germany, and Italy. These folks have been involved with various charities, but most notably Children’s Care Hospital and School in South Dakota. Hamsters are expected to participate in at least one event a year, ride to Sturgis, and pay their yearly dues. It was a real treat to visit with these riders and admire their custom bikes when they dropped in!